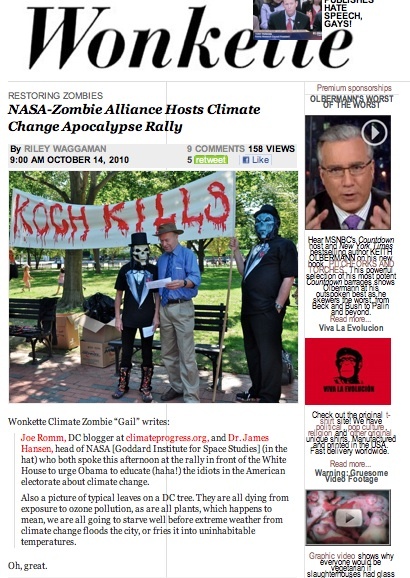 Wit's End made the Wonkette...the ultimate in snark! Unfortunately they didn't have space to include our handout...so here it is again! Awesome! Were starting to break through! Unfortunately I wont be able to get my article in for awhile. Congrats, Wonkette is teh big-time! The bigger the pile of evidence,the more likely people will pay attention. Should I continue to add to your library? Thanks, Jim! They even updated it to link my name to the blog! Highschooler, absolutely continue to add as long as it doesn't interfere with your homework! You have some terrific links - which lead to even more terrific research. I never thought when I started the list it would grow so large - if I find time (haha) I'll organize it. The Koch Kills banner made a great visual impact. And kudos to your researcher - Highschooler - that is some fine searching...think kind of info needs to get distributed.